The Broad is a very local kind of hobby horse. Found only in the area between Stroud and Bath. In this case it represented a bull rather than a horse. 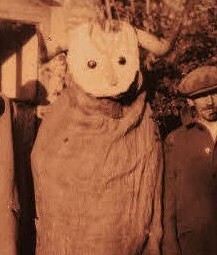 A pair of horns, fixed to an upturned old broom, a hardboard face with two bottle tops for eyes, and a sack to cover the person inside. It does not appear to be particulary ancient, maybe 200 years, but may be related to the hobby horses in mummers plays, and Mari Llwyd tradtions. The above photo shows the Tetbury broad.